No garden is completely free from pests and disease – fungal infections, caterpillars and beetles are just part and parcel of having a garden. Fortunately for us green-fingered gardeners, we can fight back against these predators without risking our own health (or that of our family and plants). We also don’t need to spend a fortune on nasty chemical insect repellents either. Simply changing the way we take care of our garden can do the trick. 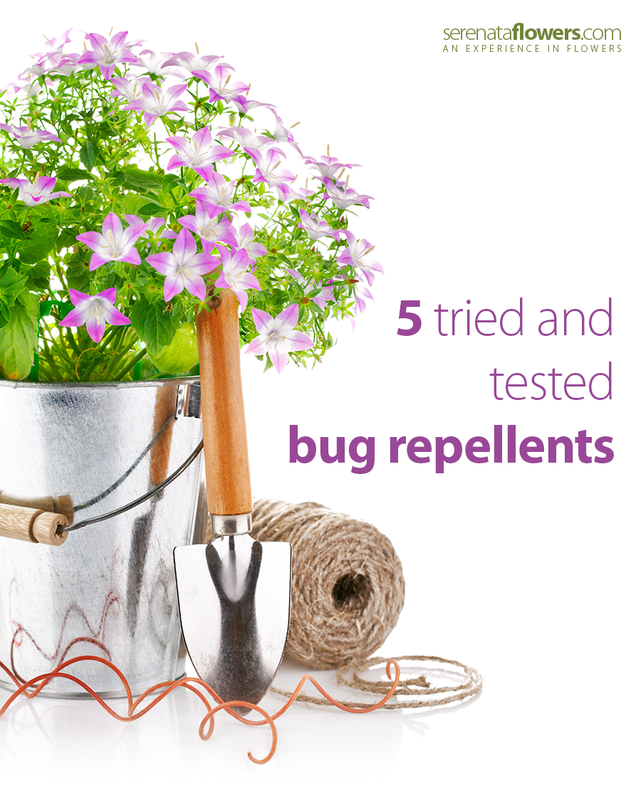 Let’s find out how with these five tried and tested ways to banish those bugs! Believe it or not, there are certain plants that actually deter insects and pests from the rest of your garden and one of these are marigolds. Simply plant a row of these beautiful blooms and be sure that your garden of flowers and/or vegetables will be perfectly safe. With their bright and cheery petals, you won’t even mind have them out and about in your garden either. Soapy water isn’t just great for washing your hands, you can also use it if you’re having an aphid outbreak. All you need to do is cut off infected leaves on your plants and spray the remaining leaves with soapy water – this won’t hurt the plant but it will get rid of any insects you have investing your blooms. If snails are your main bugbear then did you know you can use beer to stop them in their slimy tracks? Your other half might not be so happy at sacrificing a few drops of his favorite tipple but leave a few saucers of beer out at night and you’ll find snails head there instead of munching your plants. Make sure you clear up the saucers during the day though and don’t let kids or pets outside when they might be able to get hold of the alcohol. Lots of nurseries around the UK sell huge packs of ladybugs that you can release into your much-loved garden. These little beauties eat the offending insects and pests to ensure your garden stays looking wonderful – giving you a very natural way to tackle those meddlesome bugs. Get yourself some self-adhesive copper tape and apply it around your pots and containers. This will give slugs and snails a small electric shock to keep them away from your green leaves and bright buds but also adds a touch of “class” and sophistication to your pot. Talk about dual-use decoration! While the above tips are guaranteed to protect your plants from those pesky bugs and insects, there are a few other little things you can do to keep your garden looking like paradise. Always remove any visible pests you spot on your plants and make sure you cut away or remove infected or dead areas of the plant too. Nontoxic sprays and traps can also come in handy if you find you just can’t get rid of a few stubborn pests so why not give them a go once you’ve tried the above?